The Inclusion Taskforce is the key strategic partnership group which reports to the Inclusion Programme Board. The taskforce is a cross sector , school-led group whose members include school leaders, SEND lead practitioners and Local Authority officers, including the SEN Assessment Team. It has representation from all localities within the city. Moderation - ensuring consistency in Sheffield Support Grid judgements and provision for children and young people with SEND. Training - enabling and empowering the education workforce to deliver high quality inclusive provision. Review - developing the tools to evaluate school practice in relation to SEND/Inclusion in order to facilitate support and challenge. Data - developing the evidence base to inform and support school improvement. The Inclusion Taskforce will make a core training offer to the city which is currently being finalised and is likely to be free to all schools. The professional development opportunities will include the content below. They will be available on the Learn Sheffield website next month. If you have questions about SEND/Inclusion please contact those leading within your locality, for example the Strategic Lead Headteacher or the Locality SENCO(s). For more information about the Inclusion Taskforce contact Ian Read (Headteacher, Watercliffe Meadow Primary School) using headteacher@watercliffe.sheffield.sch.uk. 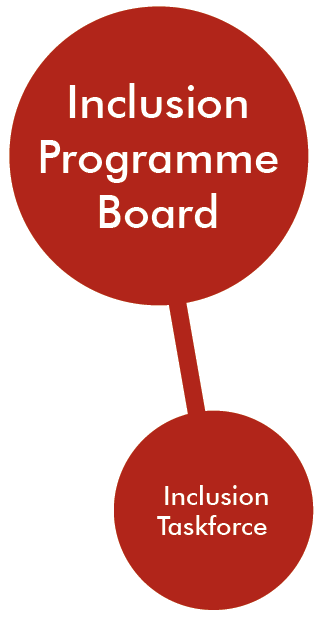 The Inclusion Programme Board was created to ensure that the Inclusion Programme transformation is successfully delivered. The board is designed to provide an expert, advisory and overseeing role for the programme. It should support and challenge the Inclusion Programme Team, and be able to remove strategic barriers to implementation. It consists of strategic directors from Sheffield City Council, the lead Cabinet member for Children, Young People and Families, strategic leads for the CCG and Sheffield Children’s Hospital, Healthwatch, Sheffield schools, Learn Sheffield and the Inclusion Programme Team. The Inclusion Taskforce is a cross-sector school-led partnership group. The objective of the taskforce is to lead the development of consistent and high quality inclusive practice across the city. The remit of the taskforce includes the development of moderation, training, review and data. We are an educational support service for visually impaired children and young people from 0 - 25. Our team of specialist staff works to ensure the best outcomes for children and young people with a vision impairment. We provide ongoing support to children and families to ensure each young person develops the skills they need to become independent adults. We aim to ensure advice, training and support is given to educational settings to ensure that children and young people are fully included in all aspects of the curriculum. To see the Service local offer go to the following link. Sheffield faces many challenges in ensuring that all children and young people with SEND receive the right support at the right time. Across the city leaders from education, health and care are committed to working in partnership to address these challenges. We invite you to join our leaders’ conference as we look together at the changes we need and are putting in place. Our day will have input from national organisations and experts as well as a chance to discuss how we can work together to change support across the city and how you can influence this. 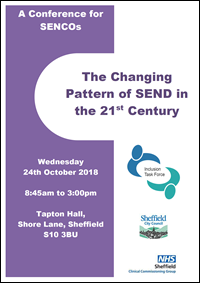 A unique and final opportunity to hear Professor Barry Carpenter deliver his work on the new challenges our pupils with SEND are presenting with. Professor Carpenter will be retiring from his public speaking to focus on his Academic work. Your Locality SENCos are leading training on the Local Authority's new documentation - a 'Graduated SEND Approach', including the new 'My Plan'. This training is locality based and is being organised by your Locality SENCo. If you are unable to attend this locality based session: The Inclusion TaskForce are leading two central training sessions. Both sessions are take place on Friday 23rd November, a morning session and an afternoon session. SENCos need only attend one. Both sessions are being held at Learn Sheffield. Locality SENCO SSG Moderation and Exemplification Training - This training is aimed at SENCos fulfilling the Locality SENCo role in their Locality. The training day will cover the new SSG moderation processes that are being put in place for upcoming SSG levelling and review (Spring and Summer Terms) as well as the newly created Sheffield Support Grid Exemplification document. Training will include support for Locality SENCos on how to lead SSG moderation within their locality and the expectations around how SENCos will submit and moderate their data. It is important that Locality SENCos attend this training so that they can support accurate SSG moderation under the new processes. 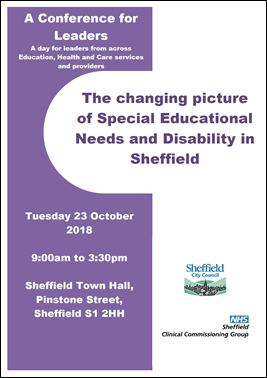 Join SENCos from across the city to learn about the updated Sheffield Support Grid moderation process and to be introduced to the new Sheffield Support Grid Exemplification document. Training will include how to use the new document, alongside the new requirements for the new moderation processes - which schools and SENCos need to know about so that they are ready for SSG levelling and moderation in the Spring and Summer Terms. This is part of the Local Authority's core SENCo training offer for the academic year. There are 2 available dates for this training (27/2 and 28/2), SENCos need only attend one.